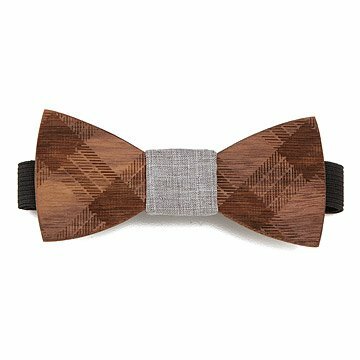 For the man who likes to keep things light even when he dresses up, this bold and clever bow tie by Adam Teague and Tim Paslay is handcrafted from walnut wood, laser-etched with a stylish plaid pattern, and accented with a swatch of gray cotton fabric. The adjustable elastic band clips snugly around the shirt collar for a comfortable fit. Handmade in Oklahoma. Based in Tulsa, Oklahoma, Adam Teague and Tim Paslay share a love of working with their hands and an interest in impeccable menswear. Made for the man who likes to keep things light even when he dresses up, the duo's handcrafted bow ties fuse old-school craftsmanship with modern style. Their growing business enables them to do what they love while establishing wood as a new and distinctive material in the fashion industry. Clean wood with a dry cloth, wipe fabric clean with damp cloth. Perfect for this co-worker! Appears to be material--but is wood. I Love Plaid and in a wood bowtie, suggestion was great!! This was a Christmas gift for my brother who is 21. He loves standing out and wearing things that are different and this was perfect for him. He loved how unique it was! Great gift for a man that likes novel attire and an item that others do not have. Given to my uncommon grandson, who immediately loved it, jumped up and left to find a mirror, put it on and wouldn't take it off the rest of the evening! I think my brother will enjoy it. Purchased as a gift for a bow tie wearing gentlemen, I hope he isn't offended that it's a slip on bow tie, but love the sustainability aspect. This bold and clever bow tie by Adam Teague and Tim Paslay is handcrafted from walnut wood.